In another dimension America the District of Columbia is represented in Congress by B-Boys…. Music Video from Fort Knox Recordings. I came across these zoomorphic fantasy maps a few weeks ago and smiled. They brought back fond memories of when I was in second grade and used to draw large futuristic cities during my free time in school. I prefer to think that those sketches were the visual result of the influence that Sim City had on me back then. These black & white bird’s eye view sketches show an elephant (above), rhinoceros (below), and sea turtle (below) all include the text of the campaign: “Our life at the cost of theirs?” The aim of this campaign is to frame the encroachment of urban life within the scope of contemporary degradation of the natural ecosystems these animals live in. By drawing these imaginative urban areas within the outlines of the endangered animals, the artists present a poignant perspective of whether our urban societies can sustain their current growth without damaging the animal’s fragile habitat. Since the original images are larger than the formatting I use here, I have shrunk them down for layout purposes. By clicking on the images, you can see them in full-size. 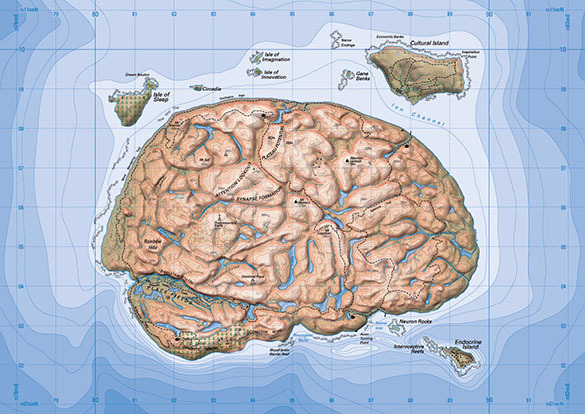 The above map’s original data was created from a reference photo of a real human brain which was used to build the 3d terrain. This digital elevation model was then used to create contour line data, relief shading and to plan where the roads and features should be placed for map compilation. Real New Zealand public domain data was then added for the surrounding islands. It looks a lot like the map I created after I did Tom Patterson’s Bryce Tutorial on Digital Elevation Models. I can only imagine how many more bodies of water, streams, rivers, hills, mountains, and cities are waiting to be discovered on that map.